Miss Serena’s Secret (2018) by Carolyn Miller is the second novel in her Regency Brides: A Promise of Hope series. This book comes in all forms including eBook, and is 344 pages in length. With a full-time job and a very busy six-year old at home, this novel took me two days to read. I received a copy of this book in paperback form from the author via her publisher, Kregel Publications. In no way has this influenced my opinion of the story. All opinions expressed in this review are my own. I give Miss Serena’s Secret 5+++++ STARS. This novel is a Regency-era Christian Romance set in England. Carolyn Miller is a gem. Her novels are wonderfully crafted and well-written, thoroughly researched, and populated with endearing characters that pull the heart strings. Miss Serena’s Secret is SO good — absolutely my new favorite of Carolyn’s novels. 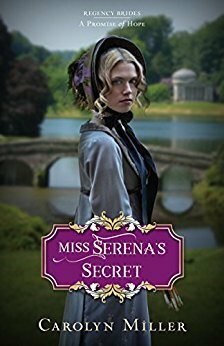 Miss Serena’s Secret is highly engaging, replete with timely messages and excellent reminders of God’s promises, and very romantic. This is a book that has made my re-read pile for sure. My favorite aspect to this novel is the hero, Harry. I love so many things about him. He is handsome and suave and swoon-worthy, but he is also kind, compassionate, and has a heart to help others. But Harry has a reputation for being a gambler extraordinaire and a massive flirt. He doesn’t want to be that man anymore. So, he works to be a better man. He goes to church and actually listens to the sermons. He reads his Bible. He begins to pray. With the help of God, Harry starts to become the man he wants to be. He does experience a moment of extreme weakness and his pride pulls him back into old habits, which means his former guilt and shame return. This moment is SO realistic! How many times have I sworn to be better at something only to fail soon thereafter? How many times have I allowed guilt and shame to daily remind me I am a failure? Too many times to count! But, when I take my head out of the sand, go back to God and ask for forgiveness, I am suddenly put back on the right path. And this is one of my most favorite things about Harry. As he learns to better walk with God, when those moments of struggle pop up, he goes straight to praying to God. What an excellent reminder to us all! Serena is such an endearing heroine! I absolutely love her strength, fortitude, talent, and heart. One thing that really got my tiger mommy in a blaze occurs when Serena is judged as not being able to do something well simply because she is young. I hate when adults look down on teens and young adults and deem them incapable simply because of their age. I am a high school teacher. I work with teens and young adults every day. Trust me when I say young people can be extremely talented, skilled, and capable. As I was reading this moment in Miss Serena’s Secret, God put 1 Timothy 4:12 on my heart: “Let no one look down on your youthfulness, but rather in speech, conduct, love, faith and purity, show yourself an example of those who believe.” What I really love so much about Serena is that she is an embodiment of this verse. This is definitely a novel I will share with my daughter when she is a teenager because Serena is an example of this quality Christian young person that Paul discusses in 1 Timothy. My most favorite message in this book is that past mistakes do not need to define a person. This is such a difficult message to grasp because it can take time to overcome the pesky feelings of guilt and shame associated with past errors. But, as Isaiah 43:25 explains, God wipes out transgressions and does not remember our sins. It’s a truly beautiful promise from God, and an excellent point Carolyn makes so clear in this novel. God doesn’t let our past define us, so why do we? This review does not do this book justice. There are so many more reasons why this book is SO good, but I will leave all those reasons for you to discover on your own. Suffice to say, Miss Serena’s Secret is a great story. The characters are excellent, the themes are timely, and the action is engaging. The romance that builds between Harry and Serena is both realistic and quite satisfying. My inner 15-year old girl heart is very happy with this story! I truly cannot recommend Miss Serena’s Secret enough. I implore you to purchase a copy of this novel today. You will not be disappointed! 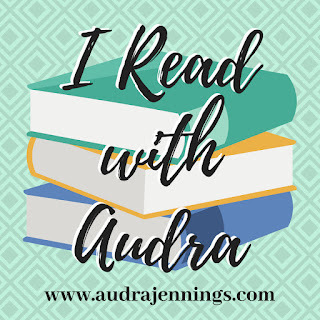 I asked Mrs. Miller to answer a few questions I had about her path to publication, Miss Serena’s Secret, and her secret to juggling all the hats she wears. She graciously responded to all of my questions. I hope you enjoy! And, thanks so much Carolyn for taking time from your busy schedule to assuage my curiosity. I love all of your novels, Carolyn. What inspired you to become a writer? And, can you briefly share your road to publication? How did you get hooked up with Kregel Publications? Despite my best efforts, I couldn’t find out – so I made it up! So 100,000+ words later, I had a story, which I then wondered what to do with. I started entering online writing contests to get feedback – it can be easier when everything is anonymous! – and eventually started to final. I was by now addicted to the rush of words, the ability to create worlds and people and see situations end as I thought they ought, so I was writing other stories as well, all contemporary, mostly using Australian characters and settings. One day I thought I’d have a go at writing a historical romance blending some of my favorite authors (Jane Austen and Georgette Heyer) with my own Aussie sensibility – and so The Elusive Miss Ellison was born. After a few years of the writing contest circuit, one of my contemporary stories won the ACFW First Impressions contest, for which agent Tamela Hancock Murray was a judge. She offered to represent me, then later discovered I’d written (by now) a few historical romance novels, which we thought might go better in the US market than my Australian based stories. After a year of shopping Miss Ellison to various publishers, Kregel Publications said yes – this was something they’d been looking to do, so they took a chance on a newbie Aussie author and offered me a contract, which then turned into a series, when I said I had a few more books up my sleeve. I thank God for His awesome timing, because the years of waiting meant I had more time to write and have a number of books I could offer when the time came. What a fabulous story about your journey to Miss Ellison. So glad you decided to really follow this path. Miss Ellison is one of my favorites of your books. It’s such a great story, and your are such a wonderful storyteller! And, I love how God brought you to Kregel. So cool! I love, love, love Harry. What/who was your inspiration behind his character? I love Harry, too! I needed a character who was something of a charmer, as a number of my heroes had been more serious – it was time to have some fun! So Harry is witty, he’s debonair, he’s something of a flirt, yet he’s got a serious thread underneath all that charm. I thought it would be interesting to explore how someone of this manner can be easily misjudged, and maybe look at some of the reasons why they might cultivate such a persona. Harry is not based on any one person per se, but I think his character and good spirits are true of some of the literary characters of Georgette Heyer that can be found in such novels as The Nonesuch or The Unknown Ajax. I’ve heard you say a few times that Miss Serena’s Secret is your favorite so far of the books you’ve written. Why is this one your favorite? I think it’s due to Harry! I love his playfulness, which balances Serena’s more serious side. I also love the focus on art, and researching this, and what it would mean to be a female artist in Regency times, was really fascinating. How do you juggle all the hats you wear? Not very well sometimes! My husband works away for much of the year, and with 4 kids aged from 9-16 it can be a challenge. I try to focus on work when they’re at school, and treat my hours between 9am and 3pm as times to write, research, edit, and do the marketing side of things as much as possible. With three books releasing each year I’ve had to learn to schedule well in order to meet my deadlines, so I’m conscious that certain weeks will need to focus more on writing, editing, or polishing before submission, which means juggling other things to keep my head in the right space in order to get things done. When my kids are home I try to focus on them (which can be hard when a story is still singing in my head! ), but it’s easier as they’re older now and more self-reliant. When my husband is home we try to schedule regular dates, so we’re not looking at all the things that need to be done around the house. I figure relationships need to take priority over housework, so we aim for tidy and ‘lived in’ not super-ultra clean. (A bit of dirt is better for our immune systems, too!) My parents and in-laws have also been wonderful in looking after our kidlets when needed to allow ‘quality reconnecting time’ – thank God for the blessing of family! Whoa! You are one BUSY woman. What an inspiration. And, three books a year. I’m guessing you don’t sleep much, Carolyn. LOL! Where is one place you want to visit just because? Where is one place you want to visit for novel research? I’d love to return to England and Scotland and spend more time there. I did a whistle-stop race around England, Ireland and Scotland in 2015, and have written about nearly every place I visited, but it wasn’t long enough (is it ever?). So it would be wonderful to spend more time in places like Bath and various villages in the Cotswolds, or to see Cornwall and Yorkshire and the Lake District for the first time, or to spend more time in London, or Edinburgh or the Scottish Highlands… So many places to see that I could use in a story! What’s in store in the future for us fans? There is a teaser at the end of Miss Serena’s Secret for the next novel in the series, The Making of Mrs. Hale which releases November 27. Then in 2019 there will be another three-book series, Regency Brides: The Daughters of Aynsley which will focus on the romances of three sisters, daughters of Lord Aynsley, a viscount from Somerset. Beyond that, I hope to continue to create more Regency romances – and maybe one day see some of my Australian-based contemporary stories published! Oh my, the teaser at the end of Miss Serena’s Secret is AMAZING. I am so glad you included chapter one from Mrs. Hale so I could have a little insight into what is coming next. You did a great job teasing the reader there! And, I love that you are doing a series on the Aynsley daughters. That will be great, I am sure. Thank you so much, Carolyn, for taking the time to answer my questions. It’s been great to get to know you a little better. Thank you so much, my friend! Your reviews and interviews are always very interesting! Thank you for sharing. Wow, Nicole! What a lovely, thoughtful review! 22 moments of awesomeness? Yay! (Fist pumps!) I’m so glad to see how God can use such things to remind us of His grace and enabling power. Thank you! Wonderful review, Nichole! I am so, behind on my reading. I had big plans for getting books read while I rested after surgery. But I didn’t anticipate that the pain medication would leave me too tired to focus on reading. This wonderful collection is on my #TBR! I stopped taking the pain meds after Monday, because I needed to be more alert. I’m glad I had several posts scheduled ahead of time!